Now in its 4th season for this battle-hardened design. This board features more area in the tail and general width, which makes it plane earlier, point higher and turn tighter. Its quad design fin configuration allows unparalleled upwind performance and drive through turns. The bottom contour has been refined for more grip in turns. By moving the fins slightly further forward Marty has enabled tighter turns in the pocket or out on the face maneuvers. A subtle move of the wide point towards the tail has resulted in a shift of the board’s sweet spot of allowing more snap in the bottom turn. The bottom contours are a mix of concave, V and double concave. This allows the water a direct path through the bottom. Rocker is lean and long on the entry with a relaxed smooth exit which combined with the outline and fin configuration gives a tight aggressive turning circle at any speed, on any size wave. Custom Performance, without the custom price tag. 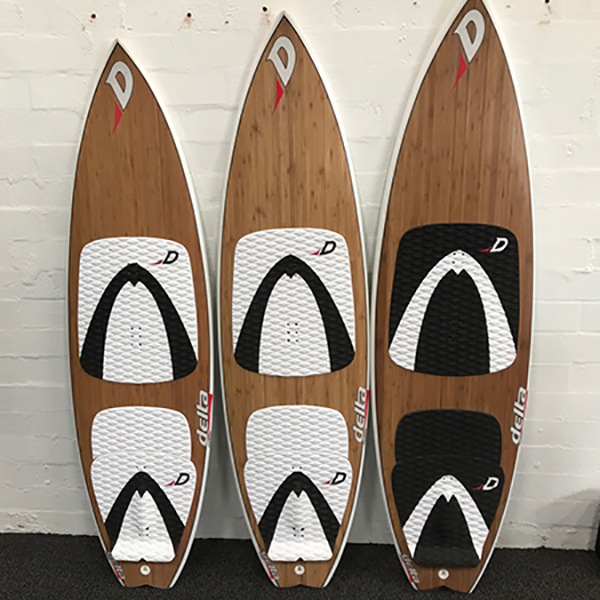 **Delta design Boards, ship complete with Quad finset, front and rear pads, straps and all fixing hardware.